Found this article at http://www.bbc.co.uk/news/health-23051516 and I had to share it.. We are getting so close!!!! This is such a break through, we are well on your way! Enjoy the article and SPREAD THE WORD!!! However, coaxing the cells to grow and form new connections has proved elusive. One problem is the growth of scar tissue as the body’s responds to injury, which seems to block cell regeneration. US scientists carried out complex surgery to transplant nerves from the rodents’ ribs into the gap in the middle of their spinal cord. They also used a special “glue” that boosts cell growth together with a chemical that breaks down scar tissue in an attempt to encourage the nerve cells to regenerate and connect up. 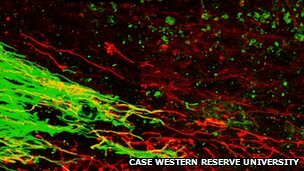 The researchers found for the first time that injured nerve cells could re-grow for “remarkably long distances” (about 2cm). They said that while the rats did not regain the ability to walk, they did recover some bladder function. The findings may help future efforts to restore other functions lost after spinal cord injury. They also raise hope that similar strategies could one day be used to restore bladder function in people with severe spinal cord injuries. Dr Silver said further animal experiments will be needed to see if the technique could work in humans. Commenting on the study, Dr Elizabeth Bradbury of King’s College London said several challenges must be overcome before the therapy can be trialled in patients. “There are a number of challenges before this therapy can be brought to the clinic,” she said. Dr John Williams, head of neuroscience and mental health at the Wellcome Trust, said the implications for people are not yet clear.